According to Education Week there may be as many as 2 million students home schooled in the United States. Many of these students are taught at home by parents that want their children to receive a Christian, rather than secular, education. Education Week reports that home schooling was illegal in 30 states in 1980 but is now legal in all states. However, parents in some states face more government regulations while teaching their children at home. 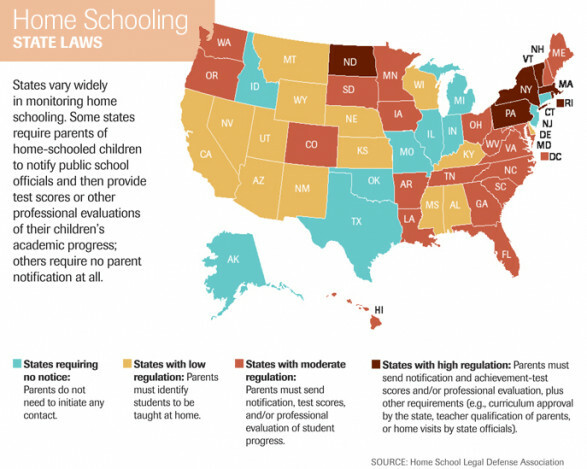 The following infographic from the Home School Legal Defense Assocation places states into four categories based on government regulations of home schooling. by edweek.Browse more data visualizations.